Planning on a trip to Oceanside in North County San Diego? No doubt you will want to enjoy Ocean views and have lots of entertainment close by. Springhill Suites by Marriott Oceanside is located just a block from the Pacific Ocean with views of the historic Oceanside Pier and the Top Gun House. As a family of five we are always impressed by a hotel room that can comfortably fit our whole family. The Springhill by Marriott layout was perfect. Our room offered two queen beds as well as a sleeper sofa. Harry and I also liked there was a work station that was separate from the main sleeping area. While our trip was purely recreational, this would have been a wonderful hotel for a business trip as well. We basically used our desk area for spinning and nonsense, but it would have been great for getting work done too. Springhill Suites by Marriott Oceanside offers a FREE breakfast that got thumbs up from our group. It is no frills – disposable plates and utensils and serve yourself, but honestly that is how we like it. When we stayed we served ourselves eggs, bacon, yogurt, fruit, and even make your own waffles. Yep – my gigantic bottomless pit had two plates, a bowl of oatmeal, and a cup of yogurt. Heaven help us when he hits his teens. I think our favorite feature was the heated roof top pool. The hotel is only a couple blocks from the Oceanside Pier. Our family walked down one morning after breakfast – read all about our morning at the Oceanside Pier <—- here. 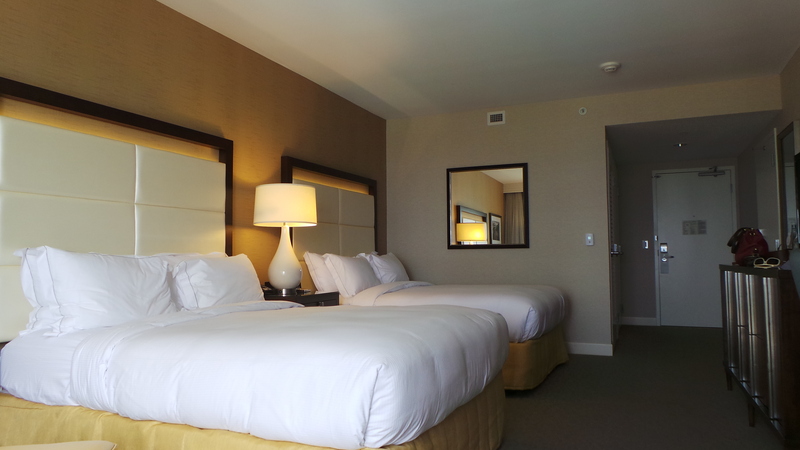 * Parking is Valet only at the cost is $24 a night – there is street parking but everything close is metered. While the hotel is a very good deal especially considering the view and location, if you are on a budget it should just be taken into consideration. * The train tracks are right up against the hotel, we were on the beach side and we could still hear it at night time. Our kids slept through it but we both woke up a couple times. The front desk does have ear plugs if you are a light sleeper like us. * Smoke free hotel – yay! I love smoke free hotels – but if you enjoy that sorta habit (quit it – it is bad for you) you should probably stay somewhere else…. or you know, quit smoking. It’s a cool hotel, it is a shame for you to miss it over a bad habit. Thank you very much to the Springhill Suites by Marriott team – we very much appreciated our stay! Who is thinking of going to Mt. Baldy during winter break? I’ve got a great discount on tubing! We went tubing a couple years ago with our big kids and it was a really fun and frugal winter activity. Our kids aren’t quite big enough to start skiing or snowboarding…. and neither are our wallets 😉 – but tubing was a lot of fun! We might just get this deal too! This is our LAST giveaway for Brick or Treat at LEGOLAND California! One lucky winner will get four tickets to enjoy a full day at LEGOLAND California! We are so thankful to LEGOLAND Ca for sponsoring this awesome, festive, and family friendly giveaway! The ‘Vampire’ that hosts the costume contest is not too spooky and even my kids who scare easily were cracking up at his funny jokes. Check out more information about the LEGOLAND Costume Contest and see if you might want to enter – it is fun and quick and it of course is just part of the fun at Brick or Treat party nights on Saturdays! We LOVE that LEGOLAND California spoils our readers during October! If you have a young family and havenâ€™t checked out Brick or Treat Party Nights at The LEGOLAND Resort it is really a splurge worthy treat. Tickets for Party Nights start at $30 making it one of the least expensive theme park trick or treat options. If your family has a year pass you can enjoy Brick or Treat at NO additional cost. You can read more about all the awesome LEGOLAND Brick or Treat activities, fireworks, and shows in our previous article. Brick or Treat party nights are held on Saturday nights in October. You can enjoy the Brick or Treat trail on Saturdays & Sundays! OK back to our giveaway! ONE lucky San Diego Deals and Steals fan is gonna win FOUR tickets to Brick or Treat for 2013! Tickets will be emailed to the winner to the email address given directly from LEGOLAND. Your email is only used if you are the winner no sharing of emails in any way, I promise! Super easy peasy entry you need to be a fan of San Diego Deals and Steals and LEGOLAND California that is it. We have several other bonus entries but only two little requirements that is totally fair right? Giveaway ends on October 22, 2013. A winner will be announced on Wednesday October 23, 2013 just in time to make plans to get your Brick or Treat on! HUGE thank you to the good folks at LEGOLAND for sponsoring a month of giveaways! Best of luck to all! LEGOLAND Brick or Treat Giveaway! You may have noticed that our LEGOLAND Brick or Treat giveaway has become a weekly event! We have had two very lucky winners already! We have another giveaway here and one more coming up next week! We LOVE that LEGOLAND California spoils our readers during October. If you have a young family and havenâ€™t checked out Brick or Treat Party Nights at The LEGOLAND Resort it is really a splurge worthy treat. Tickets for Party Nights start at $30 making it one of the least expensive theme park trick or treat options. If your family has a year pass you can enjoy Brick or Treat at no additional cost. You can read more about all the awesome LEGOLAND Brick or Treat activities, fireworks, and shows in our previous article. Brick or Treat party nights are held on Saturday nights in October. OK back to our giveaway! ONE lucky San Diego Deals and Steals fan is gonna win FOUR tickets to Brick or Treat for 2013! Tickets will be emailed to the winner to the email address given directly from LEGOLAND. Your email is only used if you are the winner no sharing of emails at all! I promise! Super easy peasy entry you need to be a fan of San Diego Deals and Steals and LEGOLAND California that is it. We have several other bonus entries but only two little requirements that is totally fair right? Giveaway ends on October 15, 2013. A winner will be announced on Wednesday October 16, 2013 just in time to make plans to get your Brick or Treat on! HUGE thank you to the good folks at LEGOLAND for sponsoring this giveaway! Best of luck to all! Summer is behind us *sigh* – but the weather is not! This past week my family and I enjoyed a little staycation at the beautiful Hilton Carlsbad Oceanfront Resort & Spa and you would never know that we had started back to school already. The weather was still perfect for the pool and the beach. I will be sharing more about events and specials coming up at the Hilton Carlsbad Resort and Spa but I wanted to share some pictures of our quick stay first so you all can keep it in mind for future stays! I am so happy to share with our local readers who are looking for a little staycation, or those traveling to San Diego a little about our stay. 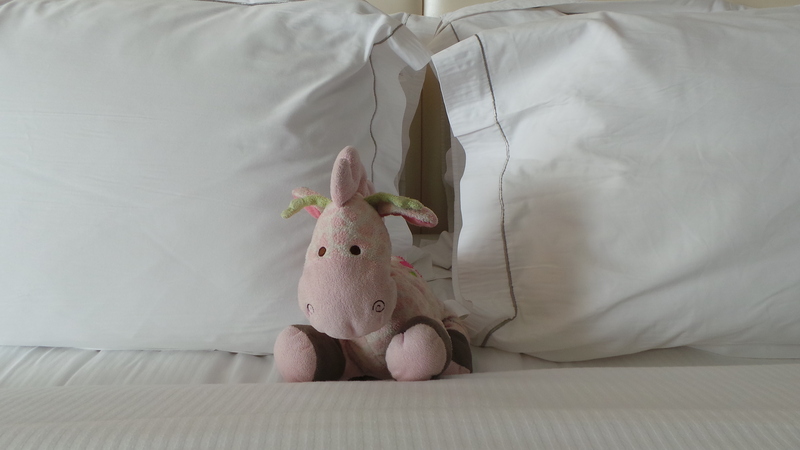 We love it when we find a hotel that is luxurious but also family friendly! The Hilton Carlsbad Oceanfront Resort & Spa is located beachfront in lovely Carlsbad Carlsbad California. Guests will enjoy views of the Pacific Ocean and can cross the street and take a stroll or swim at Ponte Beach. We always like to check out the bathroom as soon as we get there and we were very impressed! We especially loved the big oversized shower which was great for after a swim! RIGHT?! Seriously – why doesn’t every resort by the beach offer this with the other toiletries – just such a great idea! One thing we were really impressed to learn about when we checked in was that the pool at the Hilton Carlsbad Oceanfront Resort & Spa is salt water! I don’t think we have ever been to a hotel with a salt water pool but I think this is an awesome feature! 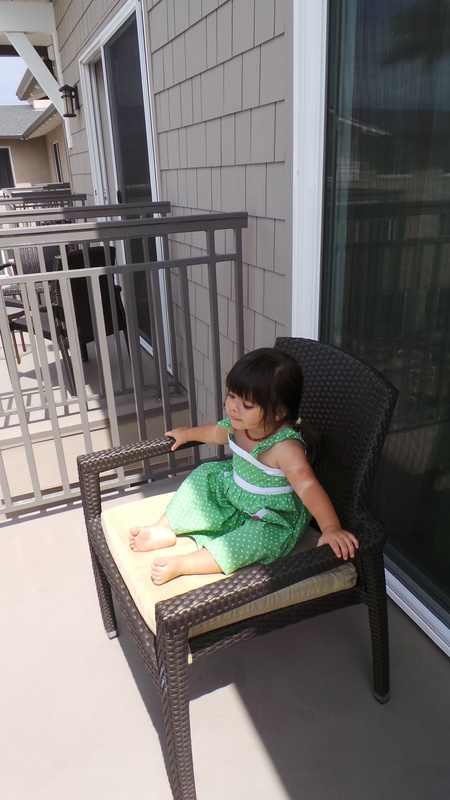 All our kids are sensitive to chlorine in their eyes and it really irritates Baby C’s eczema! I have a Brazilian Blowout and Color Treatments on my hair and I work really hard at keeping it out of chlorine – but I was able to swim and not fuss about getting my hair wet – it was really great! The pool is heated year round and the design is that you walk in like a beach – this was so great for our kids! 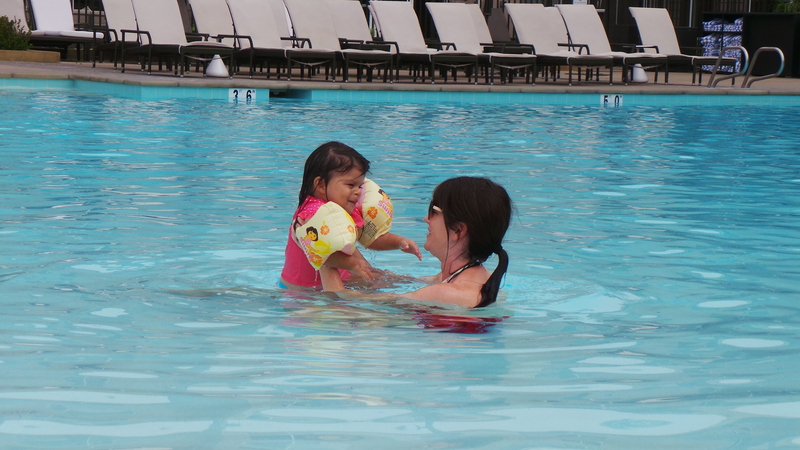 The baby loved to splash just a couple inches in and we could sit with her – no steps to fall off of! There is also a small wading pool and a jacuzzi surrounded by chairs, cabanas, and of course an ocean view! If you stay as a guest or even if you are a resident just looking for a beautiful Carlsbad restaurant make sure to check out Chandler’s Restaurant – located right in the resort. We have already put this on our “We need to check this out for date night” list, but for now, I want to suggest it for what I do know – it is a beautiful restaurant and we all enjoyed breakfast! The kids enjoyed the breakfast buffet and the grown ups enjoyed the menu choices! I enjoyed the Home-Smoked Natural Salmon: cream cheese, toasted bagel, capers, tomato (so good!)! The breakfast buffet had lots of awesome choices, but fruit loops is what the kids were most excited about. They only get sugary cereal when we are at a hotel so this was all kinds of awesome for them – don’t worry! They had lots of fruit and other healthiness too! Some of the awesome nearby attractions…………. Add Hilton Carlsbad Oceanfront Resort & Spa to your places to stay when visiting SoCal! Also – locals, this is an awesome place for not only a family getaway but a couples or friends getaway too! I will be sharing restaurant, spa, and resort specials with you too! I was really thrilled to find such a beautiful resort right here in San Diego! More to come! Thank you for hosting us Hilton Carlsbad!